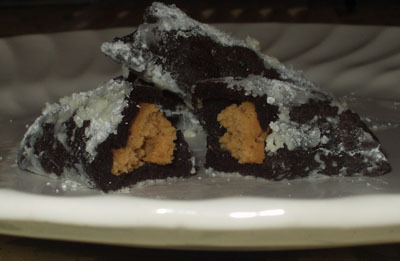 Chocolate and Peanut Butter Crescents are made by filling a chocolate dough with small amounts of peanut butter, shaping into crescents and baking. Sift together the already-sifted flour, cocoa and salt and set aside. In the large bowl of an electric mixer, cream the butter. Beat in vanilla and sugar. Add the egg and beat until thoroughly mixed. On low speed gradually add the sifted dry ingredients, scraping the bowl with a rubber spatula and beating until thoroughly mixed. Transfer the dough to a small bowl for ease in handling and set aside at room temperature. Prepare the filling by mixing together the peanut butter and confectioners sugar until smooth. Preheat oven to 325 degrees F. Line cookie sheets with parchment or foil. To shape cookies, on a large piece of wax paper or foil, place the cookie dough in mounds, using a rounded teaspoon (you should have about 66 mounds). Do the same with the filling, using a level ½ measuring teaspoon. Pick up one mound of the dough, roll it between your hands into a ball, and flatten it between your palms until it is very thin. Place one ball of the filling in the center of the flattened dough. With your fingers, bring the dough around the filling and pinch the edges to seal. Roll the filled dough between your hands into a cylindrical shape about 2 inches long with very slightly tapered ends. Place the cookie on a cookie sheet and as you do, turn the ends down slightly to form a short fat crescent. Continue shaping the cookies and placing them ½ to 1 inch apart - these do not spread. Bake for 13 to 15 minutes or until the cookies are firm. Optional Topping. While the cookies are baking, spread out a large piece of wax paper or foil and sift powdered sugar onto the paper or foil. As soon as the cookies are done, transfer them with a spatula to the mound of sugar and roll the cookies around to coat them thoroughly. Place on another sheet of foil to cool.